English author John Cowper Powys kept a diary of his stay at Phudd Bottom (just east of Harlemville). Much of his outdoor time was spent along this stream and connected waters. Following up on a couple of earlier blog entries and spurred by the Roeliff Jansen Community Library‘s upcoming John Cowper Powys presentation (Sat., Sept. 22, 6pm) and display, I returned to that author’s diaries and autobiography to assemble a small collection of his observations from the present season and to dig up a few of his more sweeping commentaries. For those of you too young or too wise to have read our previous blog on John Cowper Powys, Cowper Powys was an English author of literary criticism, philosophy, and novels such as The Glastonbury Romance and Wolf Solent. From 1930 to 1934, he lived at “Phudd Bottom”, a relatively small house along Harlemville Road on the east side of Phudd Hill. In his diary and autobiography, Cowper Powys plumbs the depths of his own psyche and that of his companions, including his partner Phyllis Playter and his dog, “The Black”. Literary figures such as Edna St. Vincent Millay, Edgar Lee Masters and Theodore Deiser make occasional cameos. Digging into those psychological and literary ruminations is best left for others, however Cowper Powys was also an astute and passionate observer of nature.While he certainly linked his walks through the natural world to his internal perambulations (don’t we all? ), they can also be read as snapshots of the culture and ecology of our area in the early 1930s, a subject closer to this blog stream’s theme. Road east of Phudd Bottom, 14 Sept 2012. Posted signs in nearby woods. Many private land owners have been very kind to us and have, when asked, allowed us to wander on their lands. The motives that lead people to post their land are complex and private property is a touchy issue. I only pause to wonder what occurred over the past 80 years to now make us look to Europe as the home of such comparably free wandering and how current limitations affect the public’s chance to know and develop compassion for the land around them. Another theme that appears time and again is Cowper Powys’ understanding that this landscape touched him deeply, because, like some familiar scent, it pulled up memories of his earlier life. The country here has the very look of the old romances that I love best. Those who love tapestry say its hills offer the same enchanted vistas as did the mediaeval backgrounds to the castles of the Gothic North. 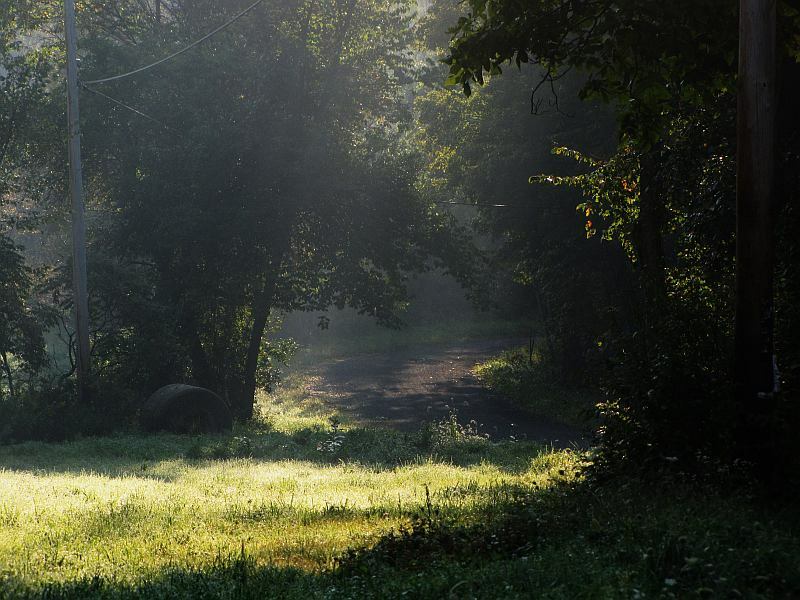 It is more like England, this district of upper New York, than any landscape I have yet seen in the whole of America. It is like Shropshire. It even makes me think of my native Derbyshire… In every direction narrow lonely “dirt roads” wind through far away valleys and over remote hill-tops, leaving behind them, as their perspectives diminish, that peculiar thrill that seems to come down to us from the generations, but which is so peculiarly hard to define. It is an impression that has to do with horsemen journeying, Inn-light beckoning, journey’s ends coming to lovers, to tramps, to hunters, to camp followers, to adventurers, to the life-weary Dead. It is an impression that has to do with all those mystic omens of the way that are driven off like hunted wild-geese by such things as “filling stations”, sign-boards, cement highways, ginger-pop stalls, and “residential sections”. The east side of Phudd from along 21C; German Cemetery is at center. 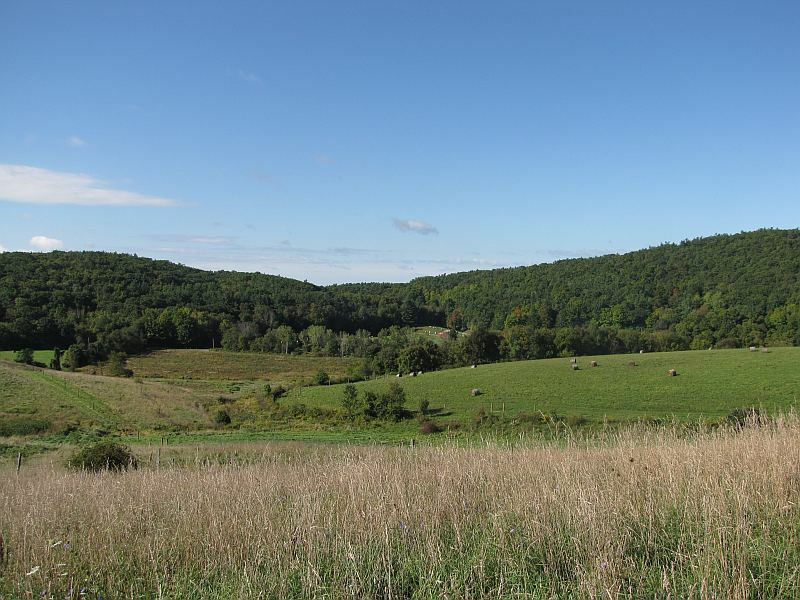 As Cowper Powys wandered about this northwest corner of Hillsdale, he seems to have been tantalized both by familiarity and the old memories that re-appeared and by novelty and the new forms of nature and geology that came before him. Likewise, perhaps, his eyes, ‘exotic’ in era and origin, can bring new views to forms already familiar to us who live here. Stone piles along top of Phudd Hill. 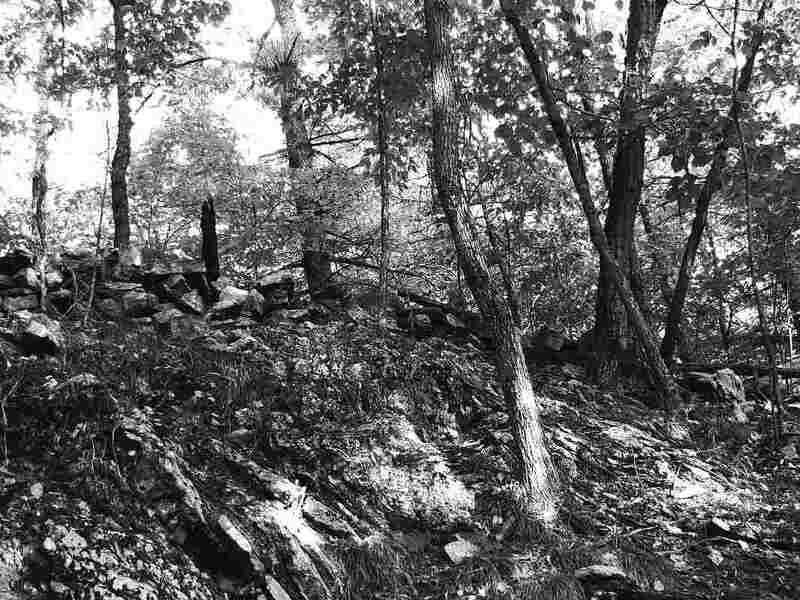 The origin of the rock piles along the top of Phudd Hill continues to be a topic of discussion. 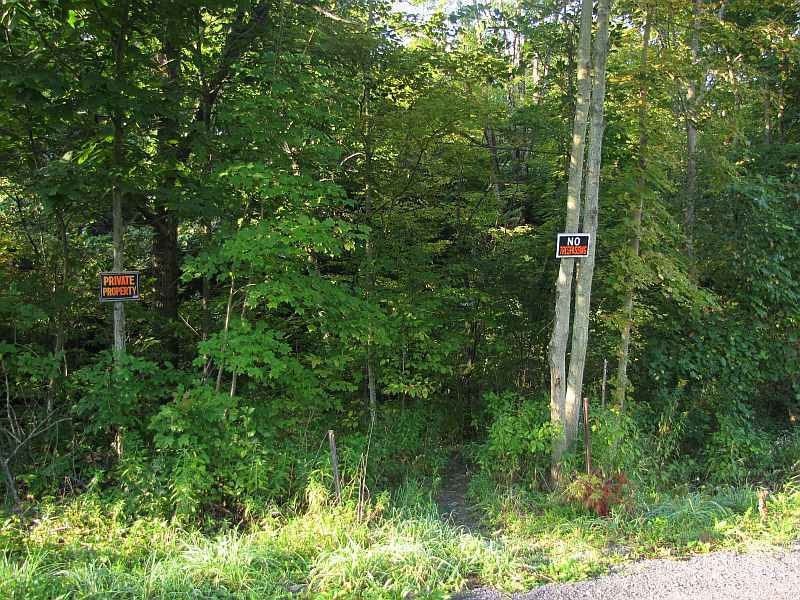 The Mohican Indians of this region (the Mohawks were actually further west), clearly did create stone mounds. Some of these became boundary markers as landowners such as Robert Livingston accumulated deeds to former native lands. At the same time, Phudd Hill is laced by rock walls (see below), and piles such as this, located at the edge of formerly ploughed land, could well have been dumpings from rock carts filled as fields were cleared of plough-breaking stones. For more on Cowper Powys’ connections to Indian culture, see this work by Jacqueline Peltier. Natural rock wall topped by man-made wall, Phudd Hill, 14 Sept. 2012. 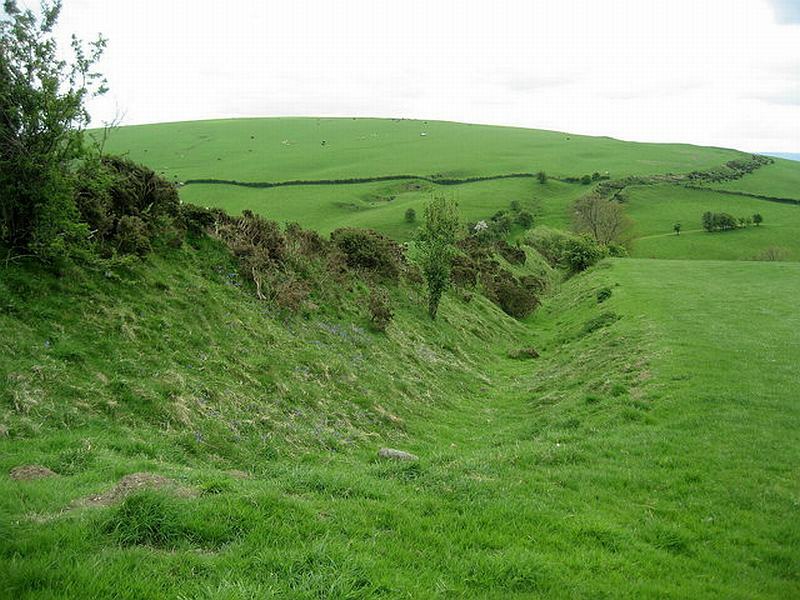 A “dyke” wall for delineating and perhaps defending territory, the Welsh Marches. In our earlier blog entry, I described a bit more about these ‘rail over rock’ fences. Today, most of the beams have rotted away leaving seemingly ineffectual strings of low rocks strung around the hills. 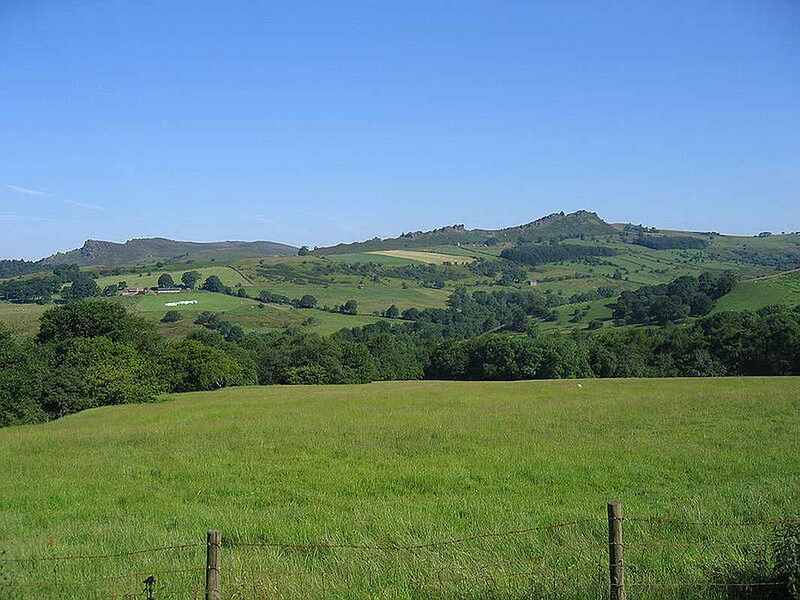 However, this extract also alludes to another aspect of landscape change – many of the “bare grassy uplands” that Cowper Powys mentioned are now forested. 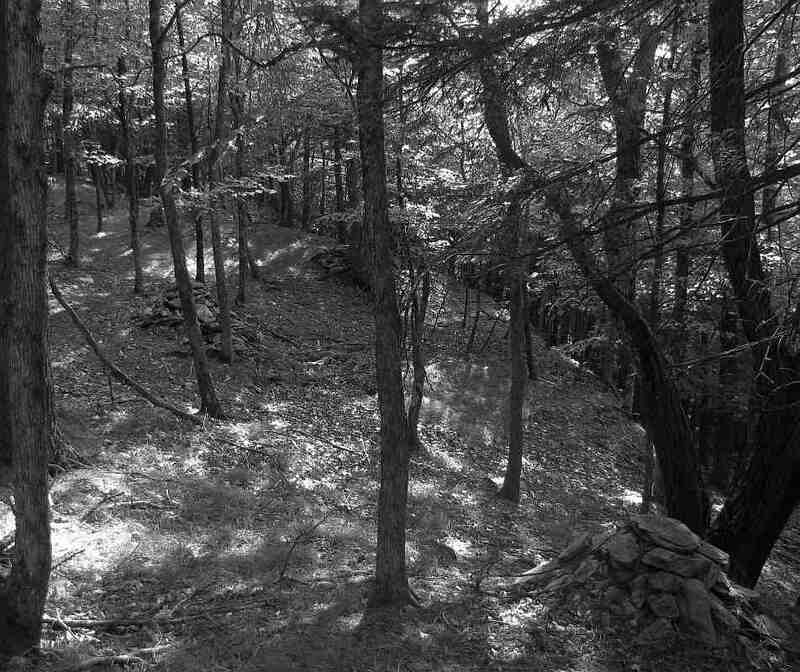 Much of the eastern half of Phudd Hill, a land now largely wooded, was bare or, at most, shrubby during his time here. One can search in vain for certain of his views, because they are muffled by trees. The landscape might not now feel so familiar to a returning Powys. The shadows of Water Striders fall onto a rocky bottom in the Agawamuck near Harlemville Road. A Water-Stride skates across the Agawamuck’s surface tension. 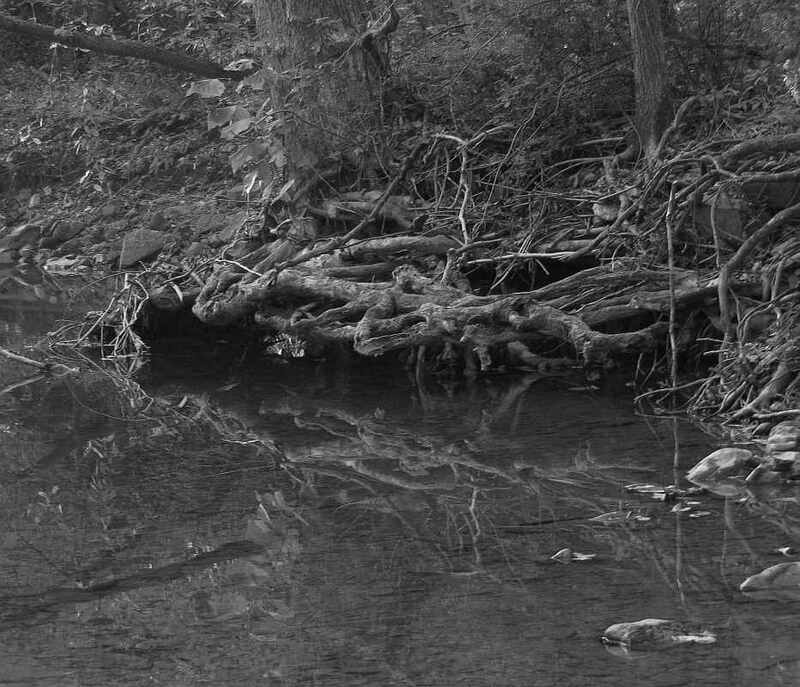 Haunts for fish, handles for climbing .. roots along tributary of the Agawamuck. Caddisflies and Water Striders (our current names for Powys’ “caddis-worms” and “water-flies”) still abound in the Agawamuck. The Caddisfly young are aquatic and construct houses from a variety of local materials, including pebbles and rocks. 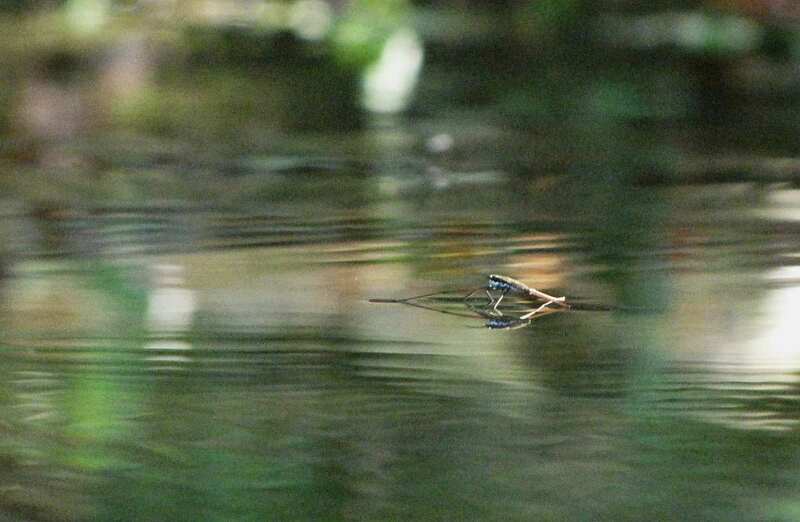 Water-striders are True Bugs (order Hemiptera) who skate about the water surface in hopes of finding some hapless living flotsam upon which to feed. The diary entries below are almost in calendar sequence, although those from 1930 and 1931 are mixed and, once or twice, I abandoned strict chronology in order to group similar entries together. 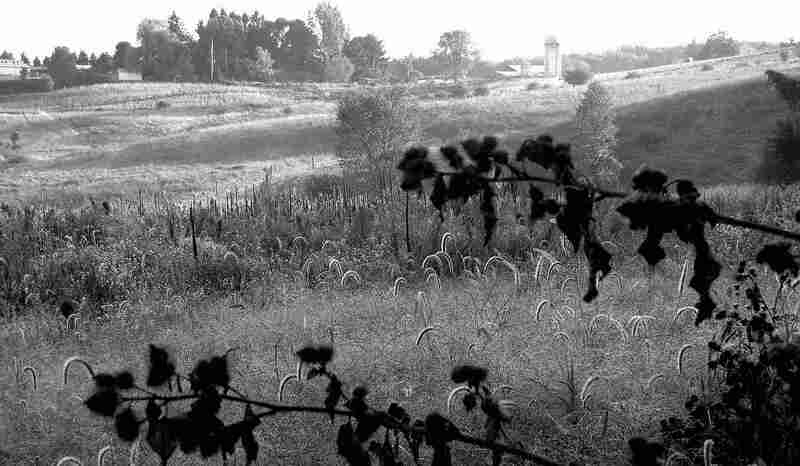 … along the hedge and then over the swamp of Pan where bull rushes and Boneset & a beautiful Michaelmas daisy .. & Jewel weed & tall green rushgrass were all tangled – into the cut field on the other side & looking back I saw the sunset thro’ the hedge. on Michaelmas (29 September); banks of the Agawamuck, 14 Sept. 2012. 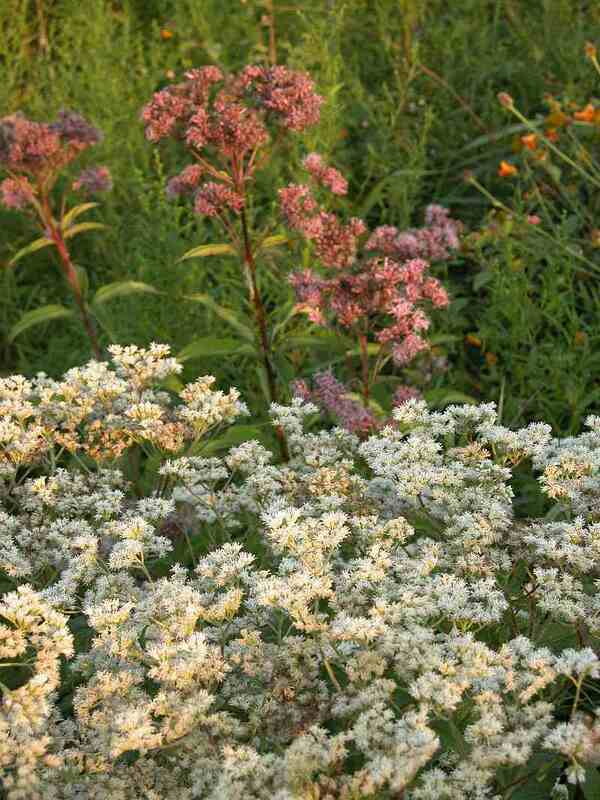 Joe Pye Weed (pinkish) and Boneset (white); 7 Sept. 2006, Hawthorne Valley Farm. 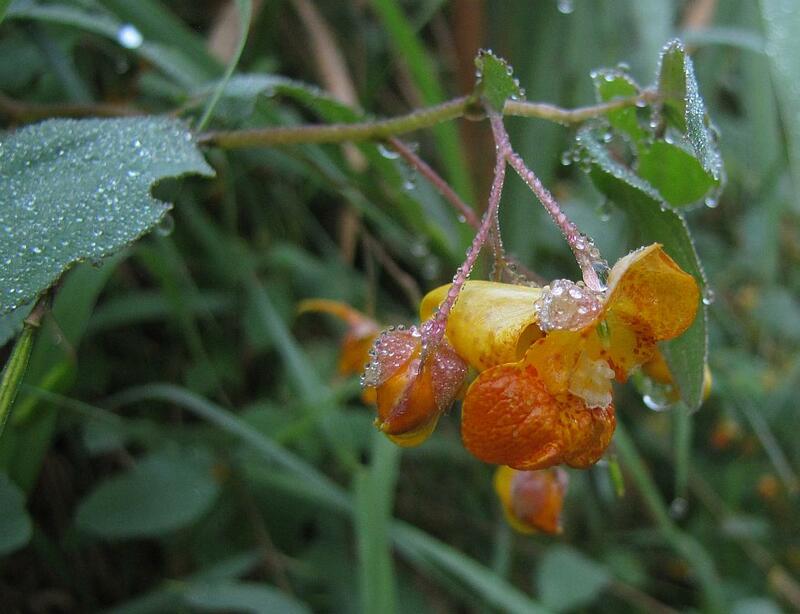 Jewelweed after a heavy dew; 14 Sept. 2012, banks of the Agawamuck. I walked up to the Red Barn on the Top of the hill – the Obstructing Barn that sent a lady mad and there, from there, I saw the Mountains, Mountains, the Mountains. This is a great event in my life to know that in half-an-hour I can go where I can see the Mountains and come back. The Catskills as seen from “Indian Lookout” atop Phudd Hill. The exact location of the Red Barn of the Mad Lady still alludes me, but the Mountains must clearly be the Catskills, distantly visible from Phudd Hill and, less completely, from atop Schober’s Hill, what Powys called “Windmill Hill” because of a rusty weather vane, along 21C. 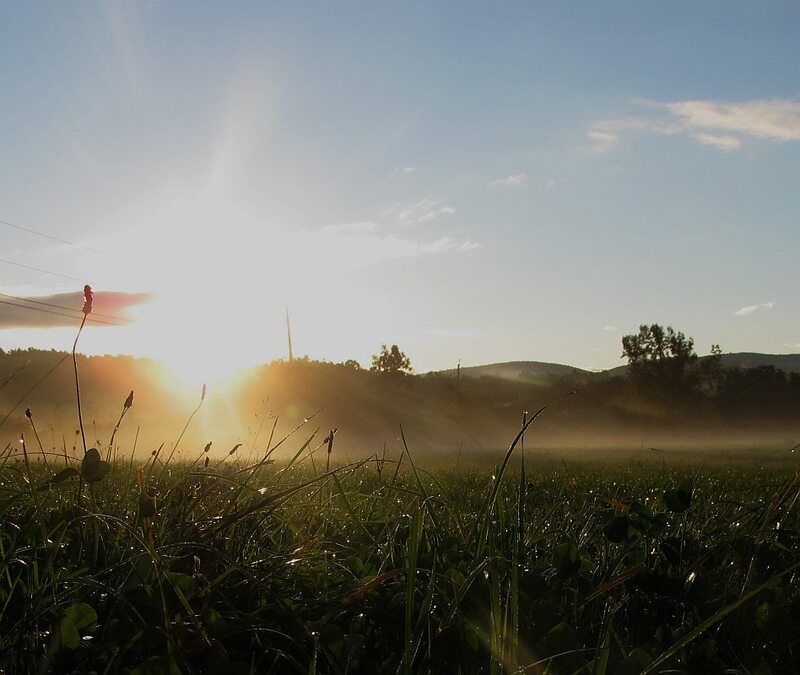 Heavy white dew of the kind that earlier might easily have been a white frost – by earlier I mean before dawn; for the sun is warm Filmy Feather clouds but otherwise a clear sky & delicious cool wind…. 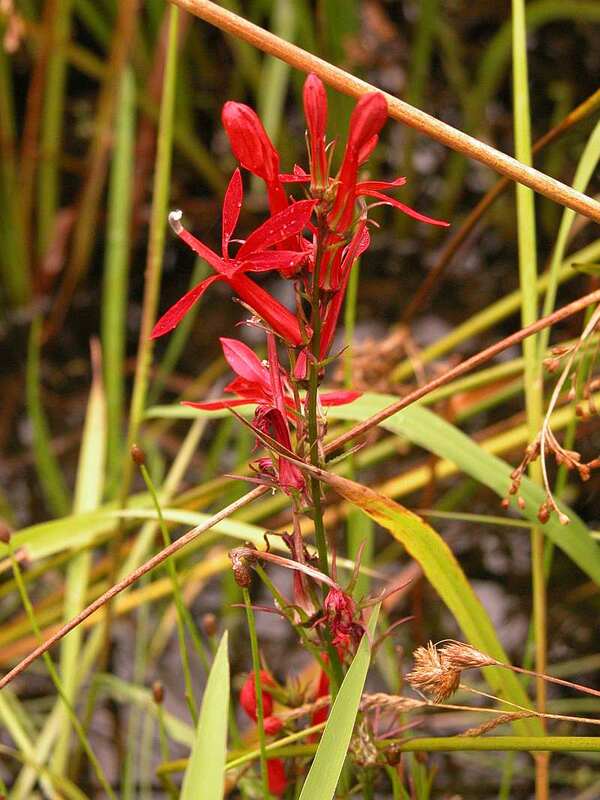 Found a Red Lobelia Found four of the Stocks [stalks] in that treat long row out…. Took Black to John Stone at noon in beautiful September sun through fields of Golden Rod and Queen Anne Lace and Yellow Toadflax [Butter & Eggs]. A lovely autumnal feeling in the cool air. occur in fields around Phudd Hill. Queen Anne’s Lace, needless to say given the name, this is not a native plant. Hawthorne Valley Farm, 5 Sept. 2006. While still found ‘in the neighborhood’, Butter & Eggs (Powys’ Yellow Toadflax) seems not as abundant as in Powys’ days. 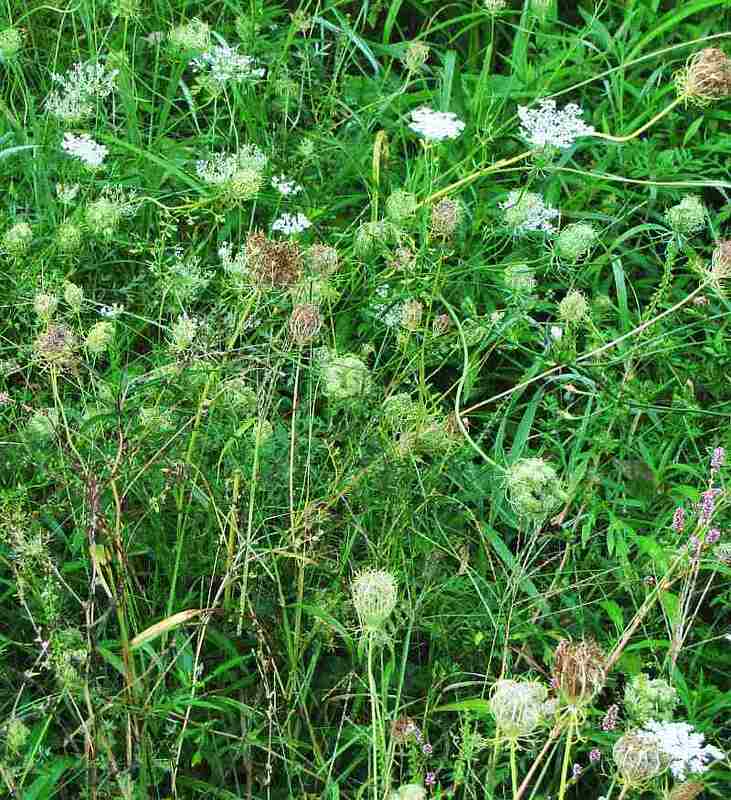 It was one of our earlier ‘invasive plants’, expanding across fields as early as the 18th century. Warm even hot. A very beautiful morning of Heavy Dew – drops of dew big as large diamonds on railings on grasses on all; especially on those lovely delicate faint straw coloured grasses like filigree of lace, made of fine hay. Soon these Heavy Autumn Dews will turn into waste frosts…. 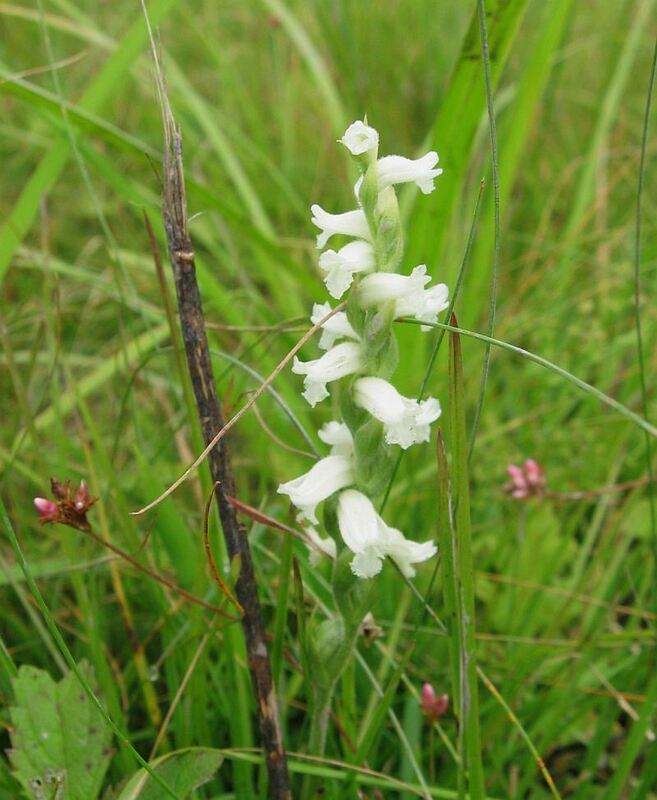 Then found two beautiful specimen of the flower like an orchid called Lady’s Tresses. Then walked right up hill to where I could see the Mountains and the hill near the River which I have named Corfe Castle. On returning I saw the big trout. The Alders field sadly dead… St. John’s Wort, Tansy, All dead and withered and black. 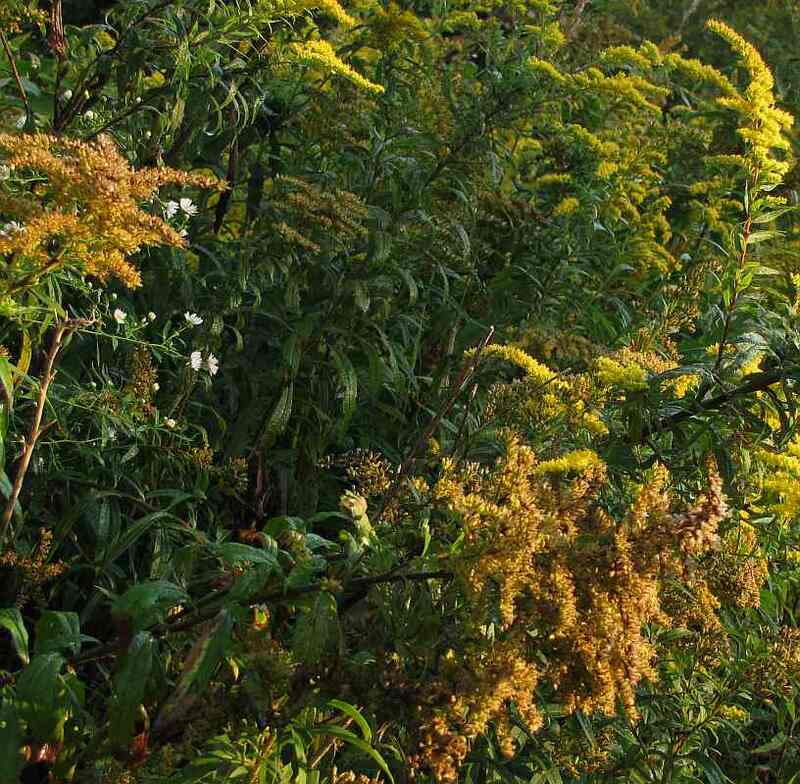 Only the Golden Rod flourishing and four tall Scotch Thistles. I held the stalk of a Gold Rod that was Far taller than I & meanwhile listened to the rippling of the stream and saw the misty light on the Plane Tree [Sycamore]. Ladies Tresses, moist field of Hawthorne Valley Farm, 21 Sept. 2011. Looking through Burdock towards Powys’ Windmill Hill, just east of Phudd Bottom; 14 Sept. 2012. 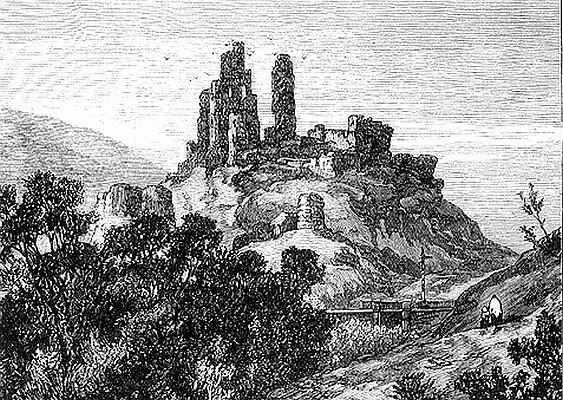 An etching of Corfe Castle, Dorset, England. west of Phudd Hill, 17 Sept. 2012. 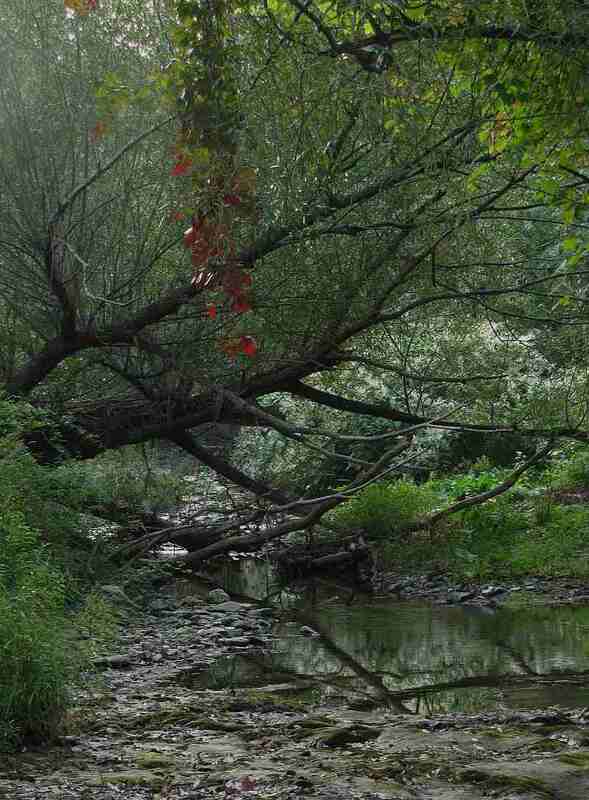 There is a beautiful red Autumn branch on an elm-tree near the Wohn Orchard [the Wohn’s were neighbors] & yesterday I noted on the great Hawk’s stone two big blood-stains which must have been red Virginia Creeper. 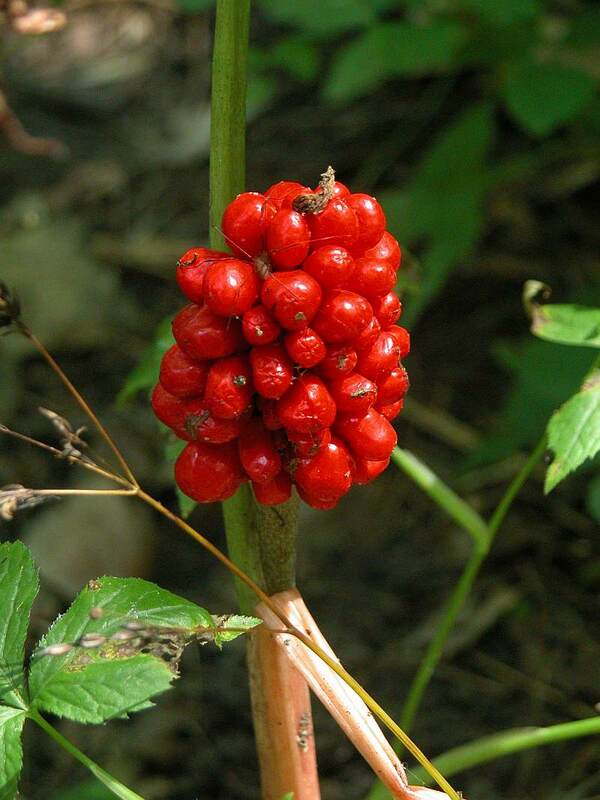 The Spinney too I noticed full of red Virginia Creep on the ground & also has many Berries brilliant & more jewel-like – like red coral beads – more than that; like frozen blood drops – of Lords and Ladies [Jack-in-the-Pulpit]. Only Golden Rod and Toad flax in the fields; & Skull Cap…. This warm weather has brought the Katy-Dids back. probably never encountered in this area; east of Phudd Bottom, 14 Sept. 2012. The hidden jewels of Jack-in-the-Pulpit, or Lords-and-Ladies. 1 Sept. 2008, Taghkanic. Took Black to river… There is still a faint trickle of water there, tho’ the water under the bridge is foul with green slime… There was a terrific noise all day. Mr. Krick helped by six men cutting his corn (maize) and putting it in his Silo. Still very hot….At noon I went for a stroll by the river which is getting terribly low & full of duck-weed and of frogspawn… How the tiny little fish and the quick water flies dance thro’ this water trickling thro’ green slime I know not! The algae-covered bottom of the Agawamuck; 15 Sept. 2012. Fallen leaves, Duckweed, and rock – 15 Sept. 2012, the Agawamuck near Phudd Bottom. I have taken the first of these two entries somewhat out of order, but this pair goes together, at least for our purposes. Algal growth (apparently what is referred to by “green slime” and “frogspawn”) still occur along the Agawamuck, but perhaps not as thickly as in Powys’ day. Their excessive growth usually reflects the presence of abundant nutrients in the water. 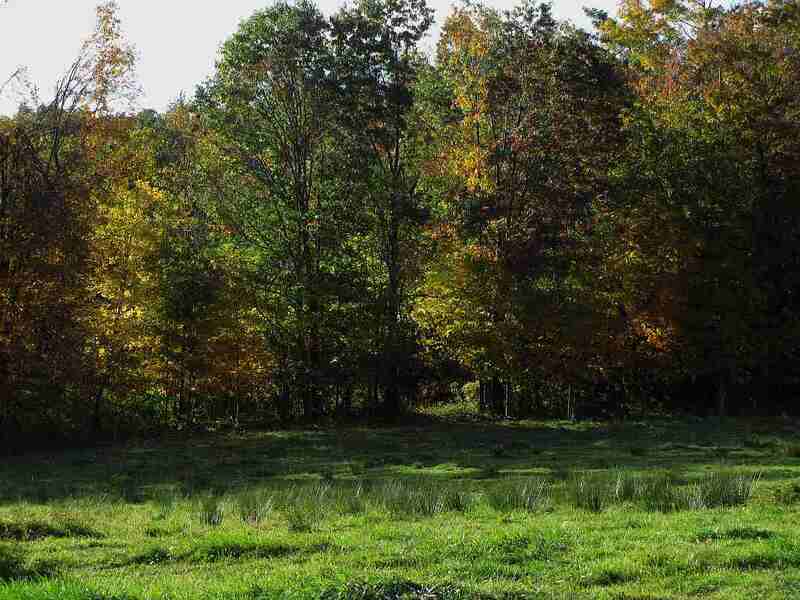 While natural leaf fall and the like are always contributing some nutrients, the dairy farms for which the neighbor Mr. Krick was cutting corn surely contributed their lot, as did streamside outhouses. 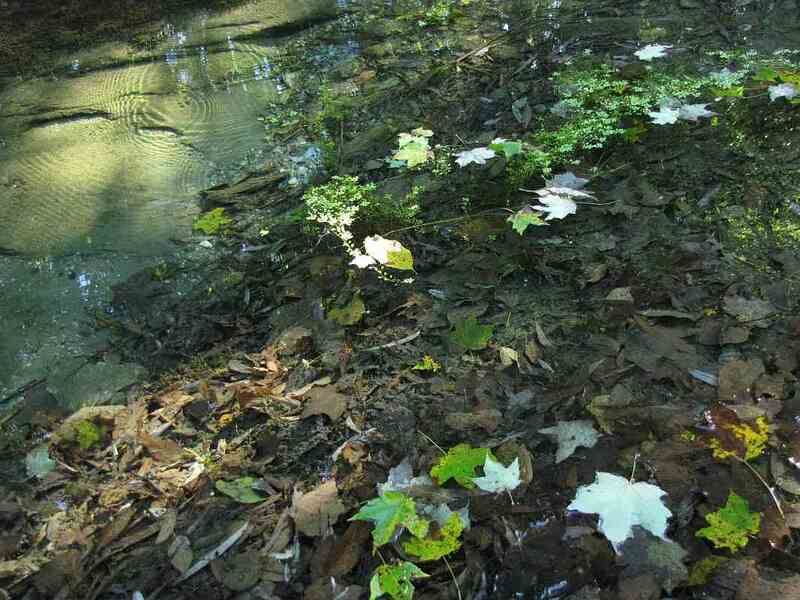 Septic systems, improved on-farm waste handling, and agricultural decline may have cleared the Agawamuck’s waters somewhat. However, algal growth also varies substantially from year to year, and hot, dry years like Powys seems to have experienced in 1931 can cause blooms. … a delicate misty dewy day with a dew-cloud over Phudd & dew-vapours regular classical Nephelae like floating essences of fragile entities over the Ridge & I thought – this is so beautiful this landscape but I must go to bed & enjoy it at one remove listening to the crows and the owls & Mrs Krick’s chickens. 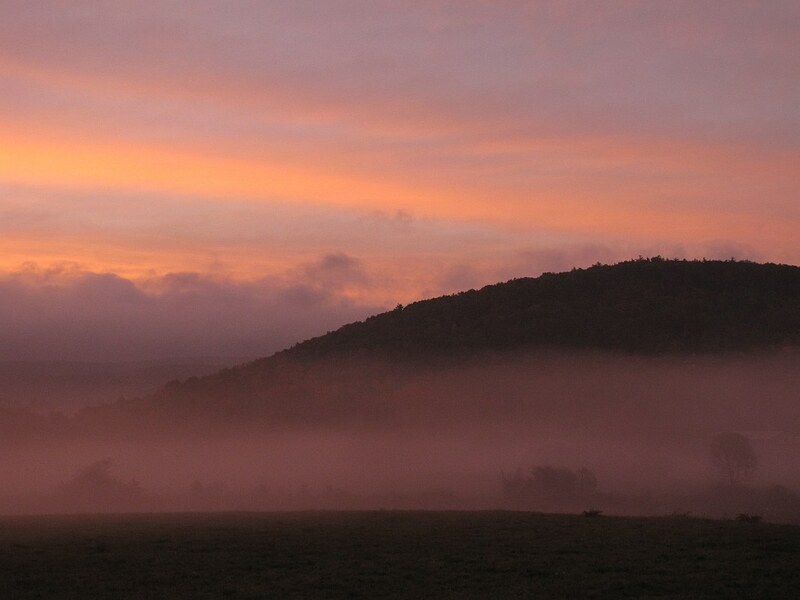 A misty sunrise over the west face of Phudd, 23 Sept. 2010. .. the Golden Rod is dying… beginning to die… yes, on this the 18th September the Golden Rod is beginning to wither. The last of all the year’s flowers to look fresh… I mean those in large quantities… is a certain small white Aster, white with the faintest lilac tinge but a sturdy little plant & the greenery of it so filmy & delicate. 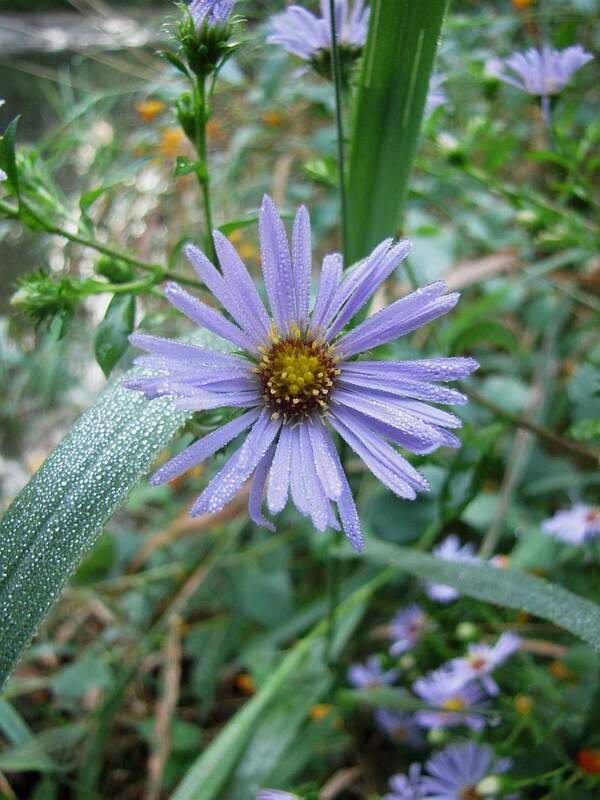 This Aster this little common Aster is now in its heyday while Golden Rod begins to fade. 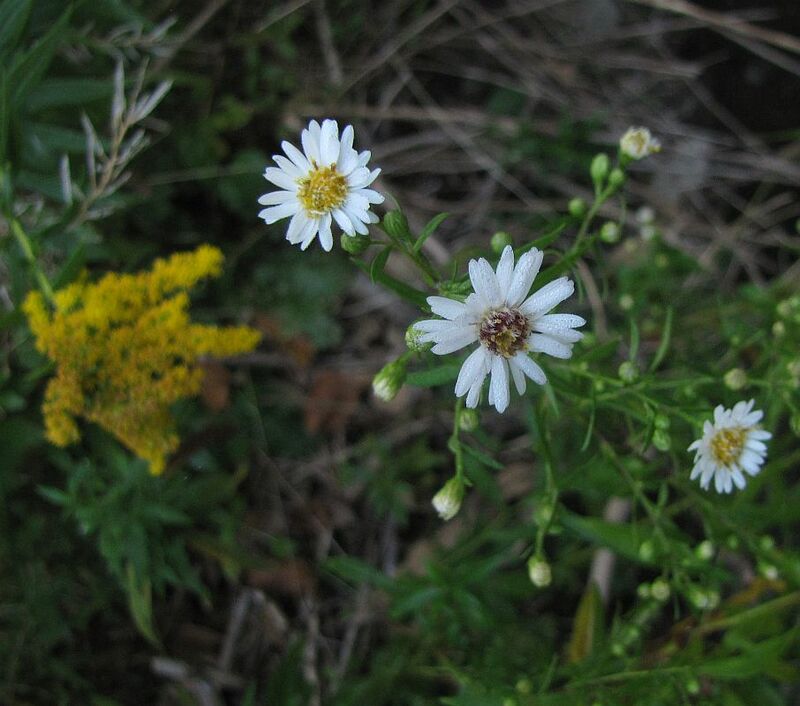 Aging Goldenrod and sparks of a white daisy; 14 Sept. 2012; roadside near Phudd Bottom. Goldenrod and Calico (?) Aster. 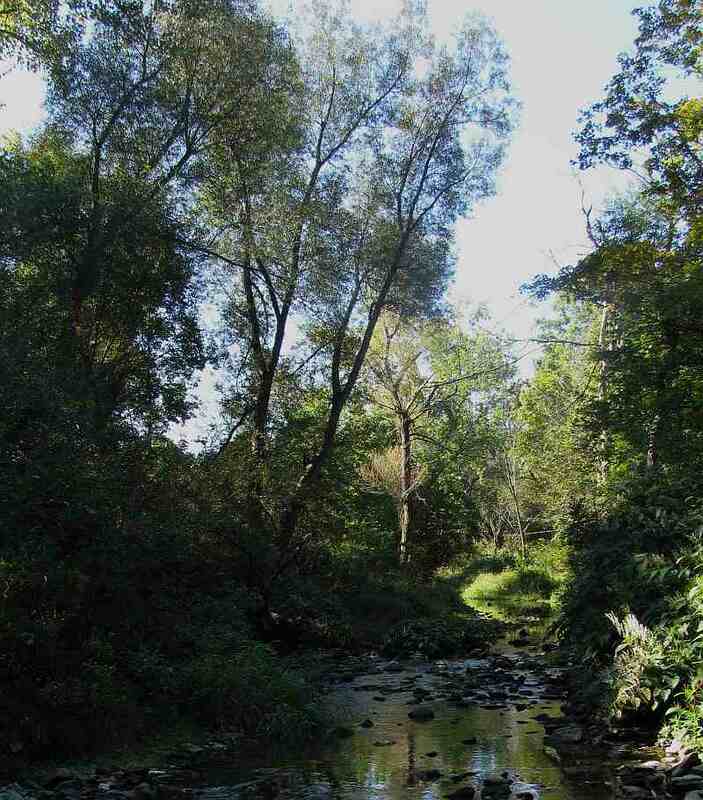 I walked along the river on this side following the line of willows and finally coming to a hedge of wild raspberry… I met a beautiful green frog… he was green and beautifully spotted; a tiny saurian and very wise. A spotty Greenfrog from hereabouts. 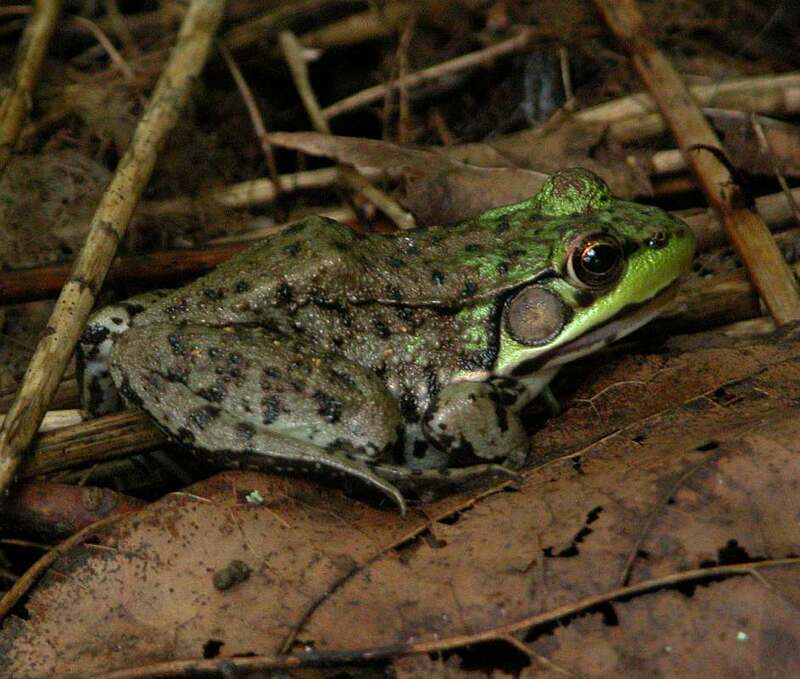 Not all Greenfrogs are so mottled. Willows (and assorted other shrubbery) along the Agawamuck, just east of Phudd Bottom; 14 Sept. 2012. 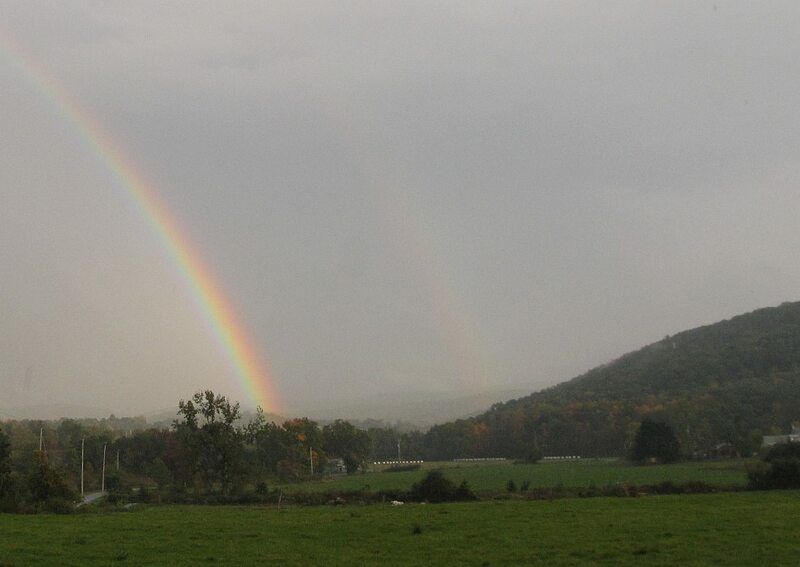 Rainbow(s) north of Phudd Hill and in front of Powys’ Windmill Hill; 28 Sept. 2009. I took pail & net & rescued fish. .. They are all Trout – beautifully spotted with little red spots & one with a black back. Caught a very broad light coloured fish and three others all big ones from a rock pool. Their tails look so funny all poking out from under the same stone. Three under one stone, side by side like fish-horses in a manger! I … saw a very strange unforgettable sight seen by few living men I wot! 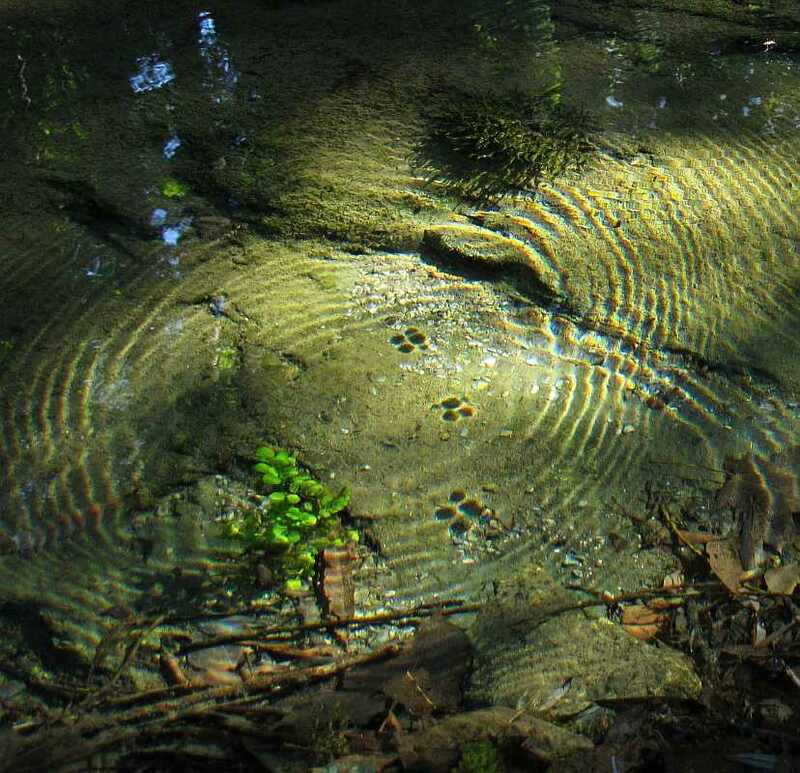 I saw four fish in procession cross a strip of dry land from under the rock into the pool. Caught quite a lot of fish – they have now come out from under both rocks & few are left in my three pools & my grand aquarium has a whole shoal of large fish – are they brown trout – with broad yellow backs, striped with black. individual may be a Brown Trout. 16 Sept. 2012. As Powys notes in his autobiography, he was often hounded by concern for fish in the drying pools of the Agawamuck. He spent hours ferrying the fish of shallow, drying pools to deeper “aquariums” as he called them. As he surmises, he probably was seeing Brown Trout, a European species that was (and is) being widely stocked in the area. 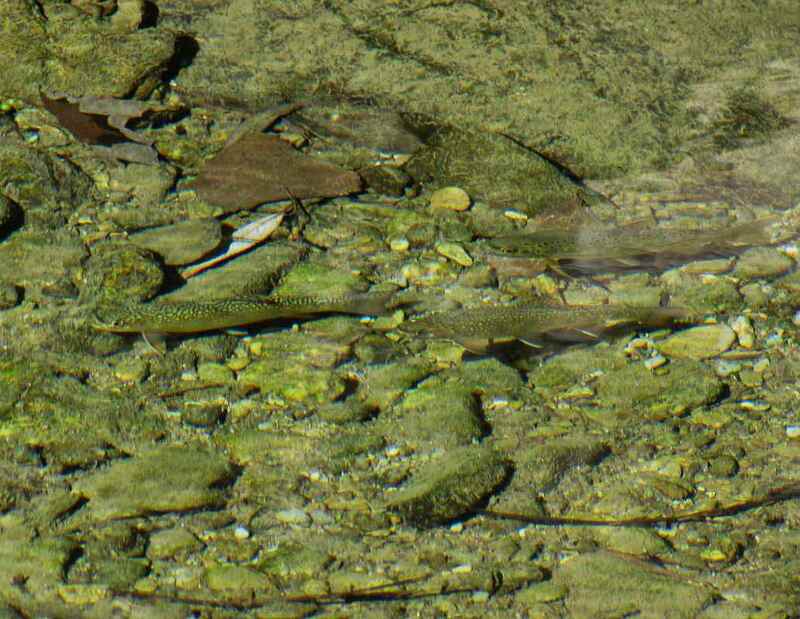 Probably also present but more skittish were Brook Trout. These are a native species, although they have also been extensively stocked and so which populations, if any, are really native to a particular stream can be difficult to know. 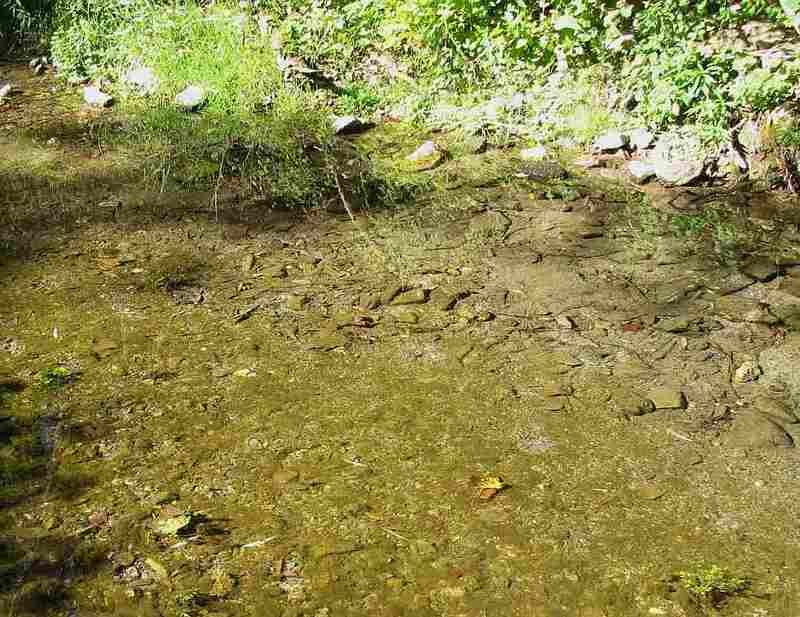 The presence of so many trout suggest that water quality wasn’t regularly as bad as his earlier 1931 descriptions might suggest.The light, broad fish may have been a Golden Shiner (to see one, visit our fish tank at the Farm Store). He was obviously and rightly stunned to see the ‘walking fish’; he repeats the description in his autobiography. Some fish are known to move short distances over ground. While it is difficult to imagine trout accomplishing this, Creek Chub, another fish in the watershed, might be more adept. Half Phudd is now yellow with autumn tints. The most beautiful tree round here is the Maple on the right hand of the road going towards Wohn Bridge – I am referring to the autumn tints!…The first one of all to get red is a very small Maple by the rail of the Wohn Orchard. Brilliant red now is the Sumach on Stein’s Hill & also near our own garden – what a garnet red and Ruby red and wine red all mixed together the Sumach is… Why then do I not justice to the Sumach… I’ll tell you why… because I have no old memory connected with Sumach – yet it has not yet won me over… but is beginning to do this now by its ruby redness in this weather but it may still be only beginning to win me over when I die. 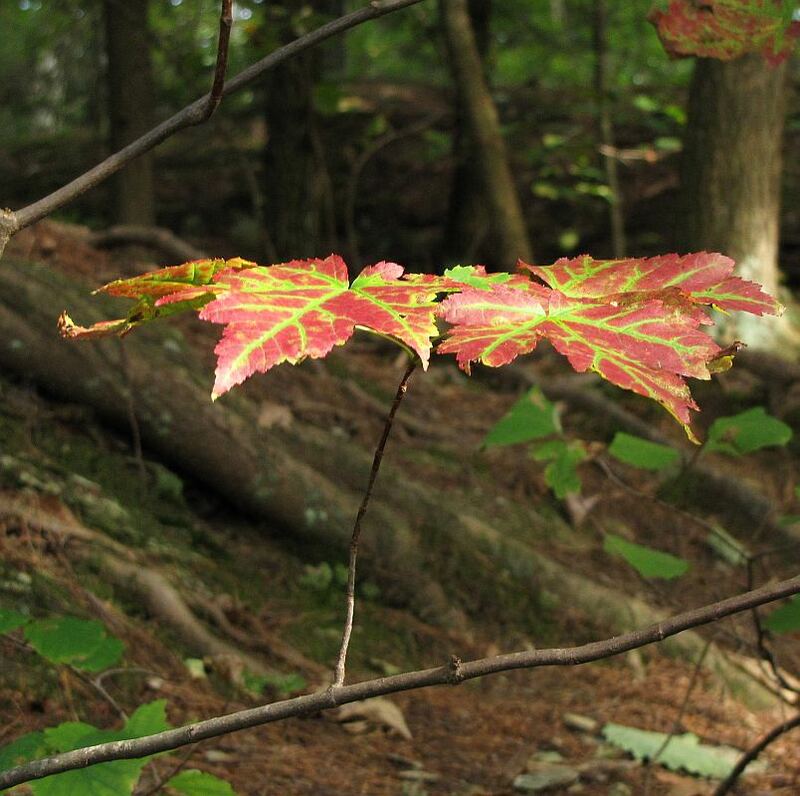 A young Red Maple just starting to turn, west face of Phudd Hill, 15 Sept. 2012. 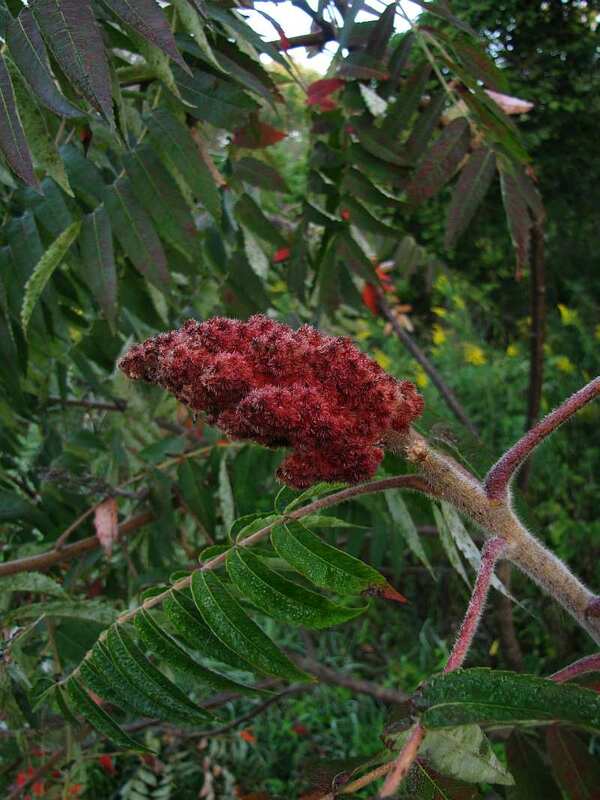 The seed head of Staghorn Sumach, behind it a few of its leaves are starting to turn. Sumach do not grow wild in England; roadside near Phudd Bottom, 14 Sept. 2012. 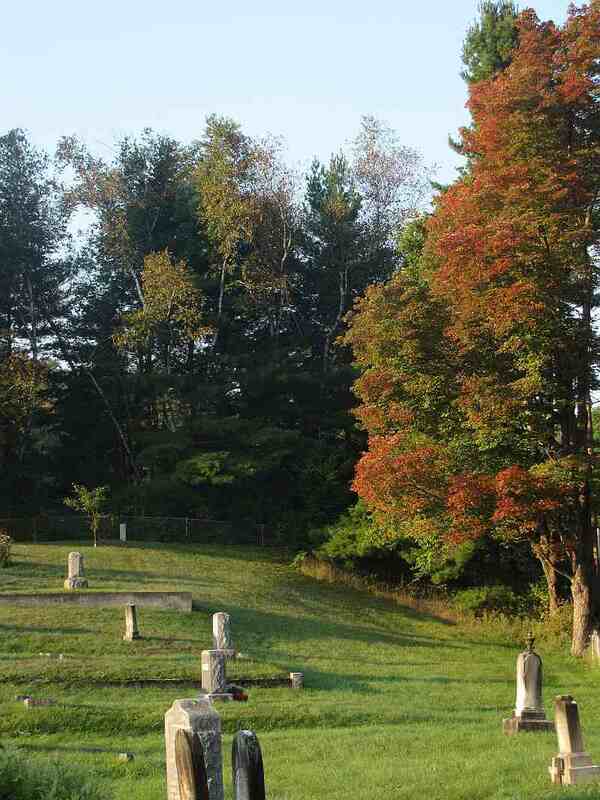 A Sugar Maple starting to turn beside the German Graveyard, just south of Phudd Bottom; 14 Sept. 2012. 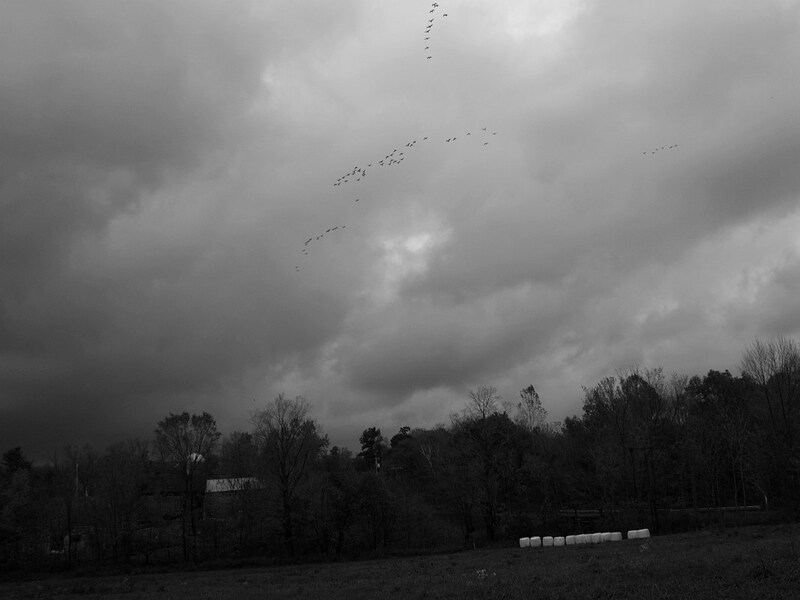 Geese flying over barn just north of Phudd Bottom; the barn is no longer standing. 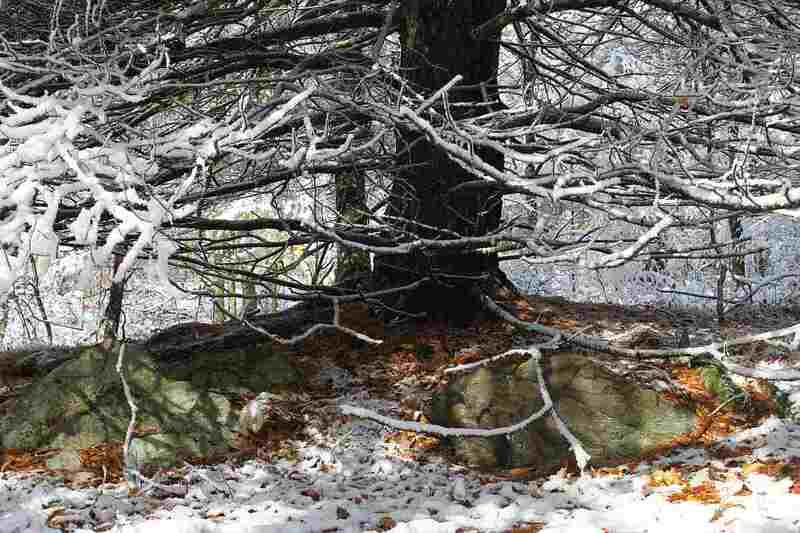 An early snow (27 Oct., 2011) on rock and pine; east side of Phudd Hill, perhaps not far from one of Powys’ ‘praying stones’. Saw the dawn or rather the sun rise. First there was the long clear line of the hills and then above them a clear watery seas of golden light and across this darker but messily gold clouds were driven by a strong north wind – this blew the actual sun rays. When the sun itself finally appeared it took the form not of above the hills but of a distinct bite, like of enormous teeth, out of the hill. This apparently was caused by the clear air which made the sun as blazing then and unbearable to stare at, as later (which is unusual) and hence where you cannot bear to look at it, it makes a bite, or a gap cut out of the line of the horizon-hill-ridge. 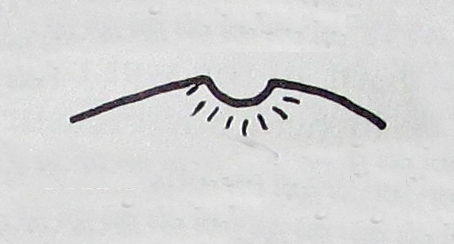 Illustration from Powys’ diary, showing the rising sun taking a ‘bite’ out of a hill top. Sun rising over Waggoner (now Fern) Hill; 14 Sept. 2012. But cold thro’ the thorn trees blows the North wind O so cold & strong & leaves do race & flutter & swilr down. Mr. Scutt thinks there’s less red than usual in autumn.. all yellow & brown this year. Our maple is Orange. Our Hickory in field is Gamboge. Our Cherry tree, both our Cherry trees are Bare – A stray Margarete Daisy & a few Achillea are all the wild flowers left. I have not seen one single purple Loosestrife this year. 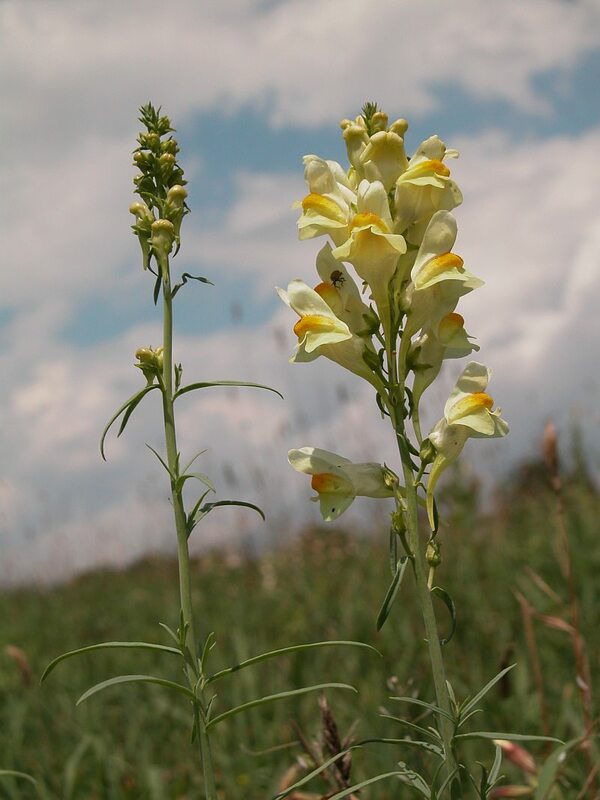 The Toadflax was the last flower to make a gallant defiance but they are all now dead. Woods just west of Phudd Hill, 16 Sept. 2009. 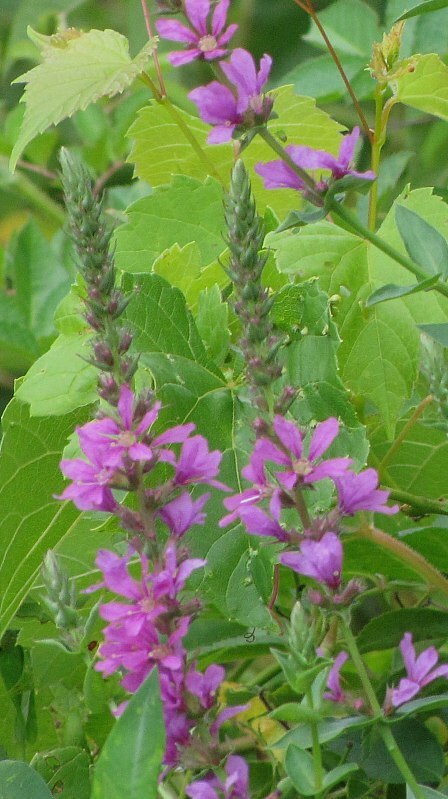 It is botanically interesting to find Powys mentioning Purple Loosestrife. 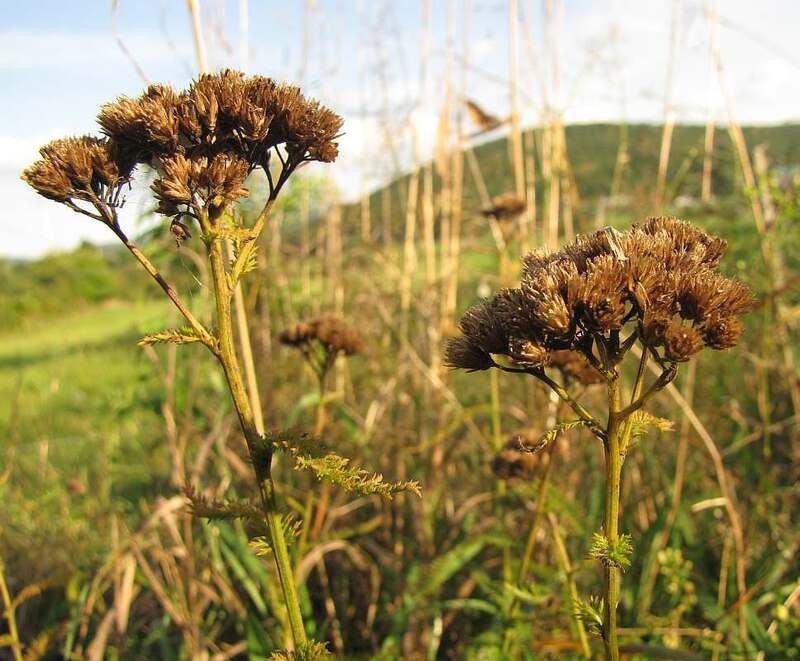 Reportedly common along the East Coast shoreline by the early 1800s, this invasive European plant (Powys probably knew it from England) has since become common in wetlands throughout the US. Regional populations seemed to have been knocked back by beetles introduced as biocontrol, but this year (2012), it again seemed particularly abundant. Saw what I think was a Star perhaps Jupiter very large thro’ the middle of the Lilac but it may have been a light in the Windmill Barn but I think it was a Star. 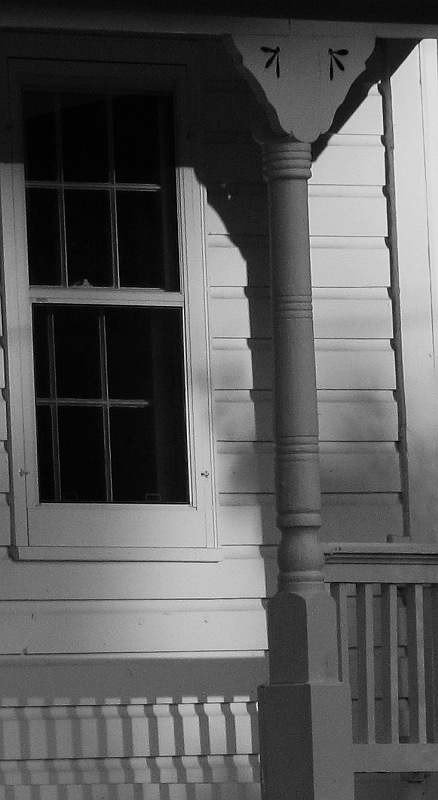 I could feel the Full Moon up above house & the house was so light with moonlight all chilly and wan that I lit no light. 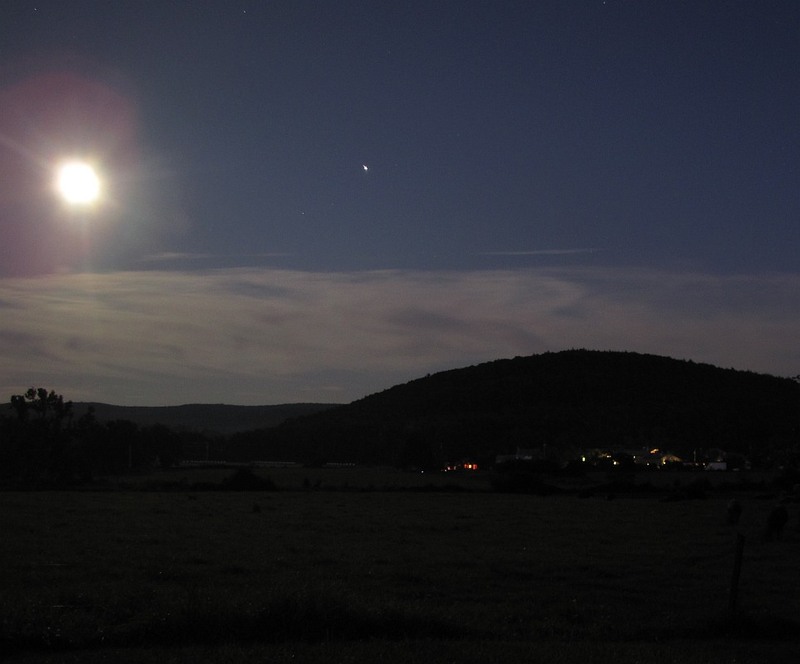 The full moon and a companion over Phudd Hill, 3 Sept. 2009.